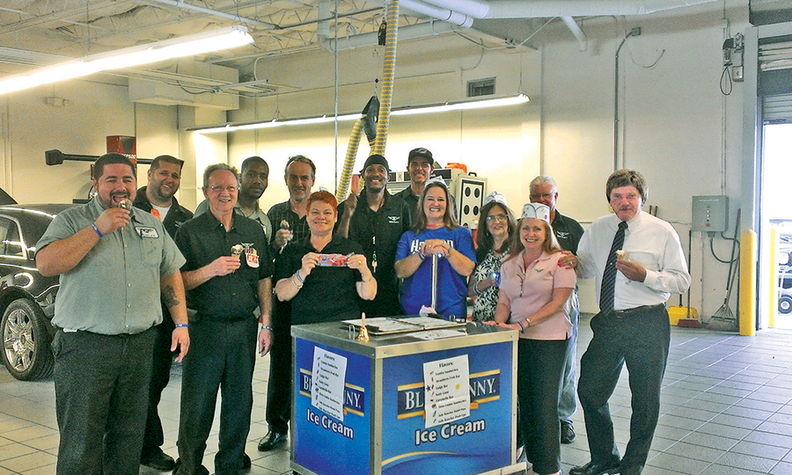 The dealership celebrated its 90th anniversary with an ice cream social. * Cool perk: Departmental successes become dealership successes, and all departments frequently join together for a free lunch to congratulate the individual department. * General Manager Larry Oden on showing employees that they are valued: "All employees participate in both monthly and yearly recognition programs, rewarding them for outstanding service and dedication to company values. Employees are also a valued part of dealership focus groups to help to improve awareness of issues that employees deem important." * Oden on a change in response to staff requests: "It was requested by the staff that we upgrade our refreshment service to customers and employees. As a result, we built new cabinetry and installed a new coffee and cappuccino machine to the delight of all."